The beautiful Spanish Timbrado Canary is said to be the domestic canary that is closest genetically to wild canaries! With lovely, elaborate songs and a variety of beautiful colorations, Spanish Timbrado Canaries can be a joy to own. The song of the Spanish Timbrado Canary consists of twelve notes. Their songs are said to be bright, harmonious, and metallic sounding. Although their songs are loud, they are not rasping or strident, and consist of many quick successions of combinations of the range of notes. Spanish Timbrado Canaries can be taught to sing on cue! They enjoy bathing and, though often kept indoors, they can be kept outside so long as the temperatures are warm. Most Spanish Timbrado Canaries grow to just over five inches in length. They usually have tight feathering that is greenish with a gray tint. Yellow, white, variegated, and cinnamon colorings are also available. Most have “fish tail” shaped tails, rather than the “pipe stem tail” type, that many canaries have, and rather short legs. 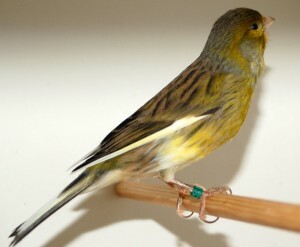 Spanish Timbrado Canaries have been bred in Spain and are said to be the purest domestic form of canary in existence! This is because they have been bred for song rather than color. 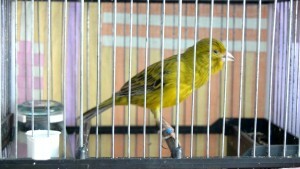 Originally imported to Spain from the Canary Islands in the 1400s, the Spanish Timbrado Canary began to be bred by an organized breeders’ association in the 1940s and 1950s in Spain. The name Timbrado derives from the timbre of the canary’s metallic voice, reminiscent of castanets, the traditional instruments used in much of Spain’s folk music. Spanish Timbrado Canaries may be kept outside so long as temperatures do not fall below 32 degrees Fahrenheit (0 degrees Celsius) and they are well sheltered from the elements. Their enclosures should be as large as possible and should be thoroughly cleaned at least once each week. Spanish Timbrado Canaries will appreciate a daily bath, and should have fresh drinking water available to them at all times. Most Spanish Timbrado Canaries will thrive on a basic seed or pellet diet, but the complete regime they are fed should be mostly made up of fresh greens.